The Taj Mahal is a site much larger than we think, the fault of the mausoleum, so well known that we hide the rest of the site, which is as much worth the look as this marble masterpiece that is the grave itself. 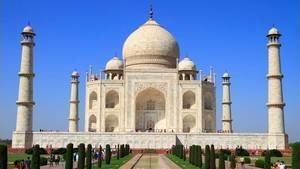 The site is 580 x 305m, it is divided into 3 parts, An entry to the South, the gardens in the center and the mausoleum in the North, as it says in the description of the Taj Mahal. The white marble mausoleum, the best known of the site's buildings, is an octagon, in fact a square with truncated angles. It measures 58.60m of side for a total height of 73m. 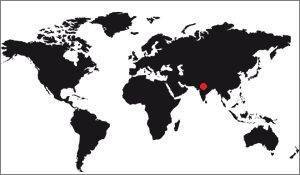 It is placed on a base also in marble of 95,16m. Each minaret is 43m high. The dome, it is 17.70m in diameter for a height of the arc of 24.4m. It is lined inside by another dome necessarily smaller, which is still 35m high from the ground. Aerial view of the Taj Mahal terrace. The mosque is 60m long and 30 wide, as is the guest pavilion, symmetrical. The mosque-mausoleum-guest house complex is based on a platform 300m long by 100 wide, it is raised 7m from the gardens. The gardens form a square of 300m side, cut in four straight channels These channels are 120m long (they are a little shorter than half of the garden to make room for the central fountain) and 6m wide. The central fountain draws a rectangle of 40m wide for a square aquatic space of only 10m side, the rest being the passage. Each of the 4 garden portions is itself cut into 4, forming lawn squares of 60m side. If the central part, close to the North-South canal, is a beautiful lawn, near the walls it is more vegetation high. The inner courtyard is a little larger than the terrace, it measures 300m long and 140m wide. In the center the courtyard itself is 40m x 40m, it is reached by two paths of 120m long (East and West), or 30m only (from the South) the main gate is 50m long by 30 wide. Here is a table summarizing the dimensions of the Taj Mahal. (*) The Taj Ganji was a vast esplanade located in front of the Taj Mahal which served as a market place, fair, and especially the arrival of caravanserails. It is the equivalent, nowadays, of a site which would be at the same time station of railway and shopping center. It disappeared in the urbanization of Agra. 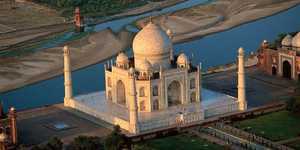 When we look at the Taj Mahal seen from above, we see that the buildings that compose it are arranged very regularly. They are like "posed on a grid", in boxes. As early as 1825 J.A. Hodgson attempted to analyze this hypothetical grid in a very rigid way, but it was in 1989, relatively recently, that real study was made. The work was published in the "Journal of the Society of Architectural Historians", it was a study by WE Begley, ZA Desai, a work entitled "Taj Mahal, the Illuminated Tomb: An Anthology of Seventeenth-Century Mughal and European Documentary Sources ". The Taj Mahal was detailed, measure by measure, as of the XVIIe century, the distances were expressed in gas or zira, two units of lengths in course at the time Mughal. It was approximately 80 to 92 cm. Begley and Desai concluded that there was a grid of 400 gases subdivided and that the various gaps they discovered were due to errors in the contemporary descriptions. Based on this work Koch and Richard André Barraud, in 2006, continued the research and found that the grid was actually much more complex than that. The layout of the buildings corresponded to a complex logic including subdivision, halving and division by 3 using decimal systems. They suggest that the 374 gas span of the complex given by contemporary historians is correct and that the Taj Mahal is like a tripartite rectangle of three squares of 374 gases. Different modular divisions are then used for the proportion of the rest of the complex. A 17-gas module is used in the jilaukhana (inner courtyard), bazaar and caravanserai (Taj Ganji) areas, while a more detailed 23 gas module is used in the garden areas and the terrace (Their widths is 368 gases, a multiple of 23). The buildings were alternately proportioned using smaller grids superimposed on the larger ones. Small grids were also used to establish the elevation ratio throughout the complex. Koch and Barraud explain these apparently very particular figures in the context of the Moghole geometrical understanding. The octagons and triangles, which are present in number in the Taj Mahal, have particular properties in terms of relations at their side. A right triangle with two sides of 12 will have a hypotenuse of about 17 (16.97+); similarly if it has two sides of 17 its hypotenuse will be around 24 (24.04+). An octagon with a width of 17 will have sides of about 7 (7.04+), which is the basic grid on which the mausoleum, the mosque and the Mehmaan Khana (Guest Pavilion) are constructed. However, there remain discrepancies in the work of Koch and Barraud that they attribute to numbers corresponding to rounded fractions, inaccuracies of reports of third persons and errors in the execution (the most notable is in the areas of caravanserais, as if by chance to the furthest place of the mausoleum).